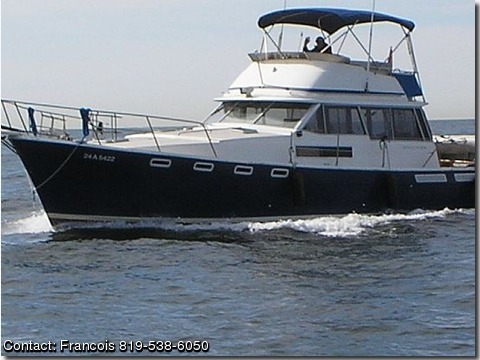 BAYLINER,1985 MOTORYACHT MODEL 3880 twin diesels chrysler mitsubiShi 251 approx 1200 hrs new bimini top 2006,new bow truster vetus 2003,new carpet 2006,new frig ,hot water tank aNd water pump and all the system include the lines,faucets. Outside wood all redone 2005.Flybridge furniture redone 2005. All the wood inside redone 2004 and all the cabin decorations new. Generator 10 kw. diesel yanmar 3 cyl. all redone in 2004 Windlass new in 2005 with remote control on the flyingbridge. Major repair on the floor of the flyingbridge,removal of all the moisture under the fiberglass.In the same repair we have remake the two corner of the rear portion of the support of the flyingbridge. All the equipments in and out works perfects. Last winter the boat was in the south FLORIDA STATE and the two air conditionning system take out of the boat and rebuilt as new. Located usually in fresh water at THREE RIVERS in quebec at the St-Quentin Isle Marina. The boat is ready to go whith all what wou need to cruse.and ready to bring you where you dream to go.Price is in Canadian dollars. regards.